The Bible continued to play out on our screens last week as we saw the final episode focused on the Old Testament. After a few weeks of double episodes, Nine has hit the brakes, screening a single episode—this time about the exile and Daniel. The producers have chopped a lot out of Israel’s history. We met baby Solomon at the end of the last episode, and heard allusions to his temple-building. But we see none of it. There’s no mention of Solomon’s reign (perhaps the budget couldn’t cover enough actors to play his many wives) and nothing about the split kingdom. King Zedekiah is now king complete with an icy stare. And up rocks Nebuchadnezzar with his Babylonian army who can chant his name with much more accuracy than my year three RE class. The prophet Jeremiah (here depicted to be a little cray cray) and his warnings have gone unheeded. God’s people haven’t been following God and have been ignoring the message of the prophets to turn back to God. Cue ominous music. Nebuchadnezzar states ‘It begins’. Jerusalem is destroyed. Enter Daniel. He gets taken amidst the scramble. Then there’s this great scene where a massive golden statue is set up and Daniel’s three mates refuse to bow down to it. So they get thrown into a fire, but a fourth figure appears and Daniel and other Israelites are astonished and bow down to it. It’s great to see this classic Sunday School dramatised and the contrast between the power of a worthless golden idol compared to the spectacular fire escape. Daniel tells Nebuchadnezzar that a new king is coming, but as one of the students I meet with mentioned to me, we don’t get to see Neb declare that God is God as he does in Daniel 4. To me this was a bit of a let down, but probably intended by producers to keep us viewing him as a bad guy. 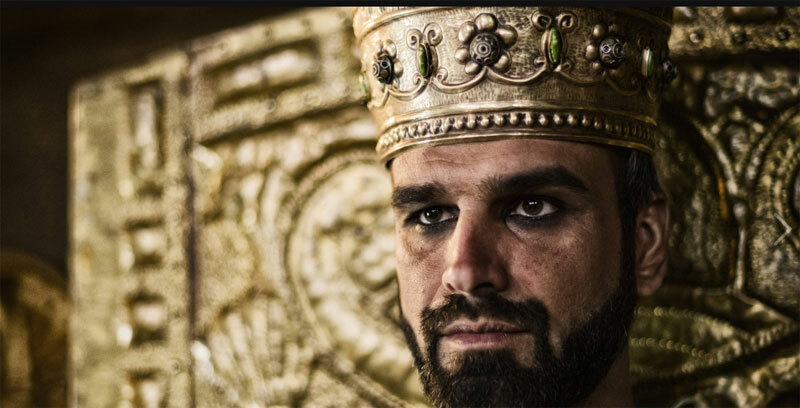 Nebuchadnezzar soon turns mad, trading in his eye liner and Dalek-inspired helmet for facial hair and prison chains. The narrator tells us that the Jewish people have their faith but are still prisoners. Along comes King Cyrus, riding a white horse with people chanting his name and pumping fists. They were certainly into chanting. There’s stacks of voiceover narration to help us along with the story, but it’s clear that Cyrus is not the ‘final, ultimate king of the world’. I guess we’ll meet him next week. We see Daniel survive the lion’s den and remain faithful to praying to God despite whatever restrictions are implemented. What’s clear is that Daniel is willing to stand out and stand up for God. He doesn’t fear death and trusts that even though the exile is horrendous, God is still faithful. He knows that these earthly kings aren’t anything on the one to come. Even Cyrus soon sees that God is real and releases Daniel and his people back to Jerusalem. Daniel concludes proceedings by stating ‘It’s not the end. It’s the beginning’. The Bible… and The Bible! As I watched this episode I was kinda longing for Jesus to come. There is so much sin and strife during this episode. We see the people of the exile struggling to worship God under Nebuchadnezzar and Cyrus. But their one true God does wondrous things just to remind them all who it is they are to worship. The writers and producers drop hints like this all through this episode to get us to see that Jesus is this king to come – which can only be a good thing! Ratings have dwindled a bit but there is still good interest and discussion going on. And now that we’re about to meet Jesus in the flesh, well, it’s a great opportunity to ask around your friends for a viewing party. It’s also a great opportunity to ask yourself – who or what are you bowing down to? Are you standing up for the One true God as Daniel and his friends did? Jesus has come as the one true King who has authority, glory and sovereign power and rightfully reigns forever. Get those cheap Tuesday pizzas ordered now and get ready for a big episode tonight! Posted in TV ShowsTagged Bible, christian, Daniel, Israel, Jesus, Nebuchadnezzar, Old Testament, review, The Bible, The Bible TV Series, TV ReviewBookmark the permalink.